Digital workspaces provide central access to, and management of, users' corporate resources, making it easier for IT and users to do their jobs. It's no surprise the workspace market is also the latest battle ground for Citrix and VMware. A new option has emerged in end-user computing to make it easier for IT to organize and support workers' virtual desktops, applications, data and devices: the digital workspace. Digital workspaces -- which are also often referred to as virtual workspaces -- aren't right for all organizations, but many companies looking to provide employees with remote access to their user-specific resources will find that workspaces can simplify IT management. Keep in mind, though, that end-user computing (EUC) is an innovating and evolving industry. Even if those digital workspaces show promise, vendors might soon develop products that are even more streamlined for users and IT. There has long been an ecosystem of people, developers, tools and platforms trying to define the boundaries of employee workspaces. They attempt to guide users to a workflow that's more efficient -- at least in theory. In recent years, many products have defined themselves as virtual or digital workspace tools. The question is whether these digital workspace products are really the answer, or if IT should continue to look for a better way to work. The major digital workspace products are VMware Workspace One and Citrix Workspace Cloud, which both center on cloud-based management. They boast complete desktop delivery, seamless abstracted applications, and aggregated third-party cloud resources. The basic premise of these products is to create a single framework where users and IT administrators can access all these resources. This centralizes management and makes the user's life easier. Additionally, the delivery of resources through a workspace environment means the endpoints workers use to access resources matter less, which makes for a more consistent user experience. We are moving to a world where information and access to tools must be ubiquitous. From an administrative point of view, the concept is attractive. Admins can take cloud apps -- such as Salesforce and SAP -- and deliver them through a single agent that also provides users access to their virtual desktops and apps. In some cases, IT might even be able to deliver telephony resources to the user population through that same tool. So why aren't these digital workspace products more widely deployed? Who should use digital workspace products? Small and midsize businesses (SMBs) are where digital workspaces have the most potential. Virtualization isn't out of the question for SMBs because they aren't limited by scale the way bigger organizations are. SMBs are also small and agile enough to adjust the resources they offer users to fit a strategic vision. If the CIO and CTO agree that users and IT admins can benefit from implementing a digital workspace product but 10% of the resources they want to deliver don't fit the mold, they can usually change that 10% in favor of meeting a strategic objective. What does the future hold for digital workspace products? There's a land grab happening among vendors over how users will work in the future. Mobile devices and wearable technology affect consumers' behaviors and work habits. That forces corporate IT departments to adjust accordingly. Digital workspace products try to blend old with new, but ultimately they still don't deliver a clean user experience to touch-based mobile devices. History has proven that stop-gap technologies rarely gain widespread adoption. At the same time, a generation of vendors such as PowWow Mobile, HopTo, StarMobile and others are building app transformation platforms that file the corners off square-pegged legacy apps so they fit into the round hole that mobile-ready apps already conform to. One day, IT pros will look back and chuckle about a time when data and other resources were in physical silos. Admins will laugh about all the different ways IT tried to make users more efficient. Take caution when planning an entire EUC vision around workspaces, though. Digital workspaces are a useful, unified way to manage and provide resources right now, but IT will someday discuss workspace products the way they talk about bulletin boards and overhead projectors today. We are moving to a world where information and access to tools must be ubiquitous. Digital workspaces are a step to bring that vision into reality, but they aren't the end game; they are a bridge. 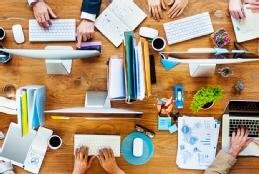 How prevalent do you think digital workspaces will become in the enterprise? Enterprise IT can take a lesson from the Xbox One, which strives to bring home entertainment under one umbrella, by embracing the potential of digital workspaces. Digital workspaces, which give users one access point for all their resources, are great in theory. In practice, there are concerns about vendor lock-in and other issues. Virtual workspace products make employees' desktops, applications and data available to them in the office or remotely. But not every company is well-suited to reap benefits from workspace products.